I have been very lackadaisical this weekend, busy making soap but I wanted to share this new blog I have discovered! I have been reading it over the weekend and think she has some great garden projects and some I am wanting to put aside time to try. Her name is Melissa Will from Ontario Canada. Her blog is called The Empress of Dirt! 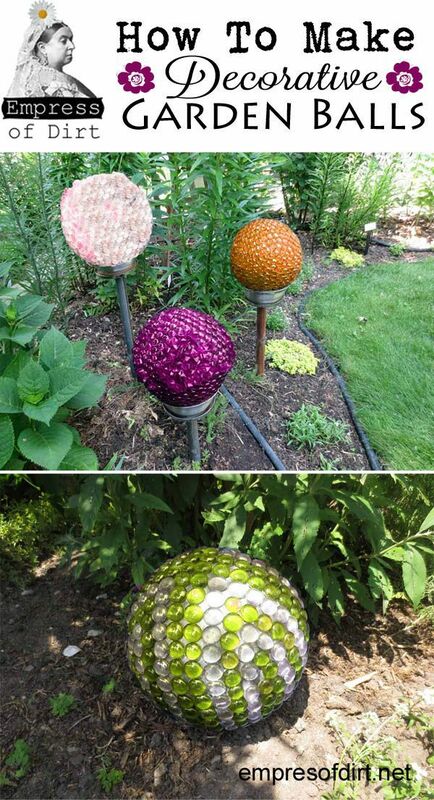 I am wanting to make these Garden Balls plus she also has ones that use jars. She also has an e-book, free planting guide and other projects and goodies to share. So if you are into dirt and digging around, grab a cup of coffee and explore her site! Thank you for sharing this 🙂 as I am looking for a unique decoration on my little garden and catch this my attention. Wow nice garden .love it.Keep up the great work! Glad you liked them and have fun! Great garden. They look so gentle and amusing. I’ll love to do something like this once I have children, we can keep ourselves busy throughout the weekend just making the garden look so beautiful. Excellent ideas! My sisters will usually take a snipping from succulent plants (elsewhere) to add to their apartment porch plants. Whatever develops and takes root are always great and usually the snipping is free. Great! Glad I could help inspire! It’s extraordinary and uncommon thing. Thanks for sharing this as I have never seen like it before. Thanks for sharing this post It provides me some important tips that I have been searching for a long time.